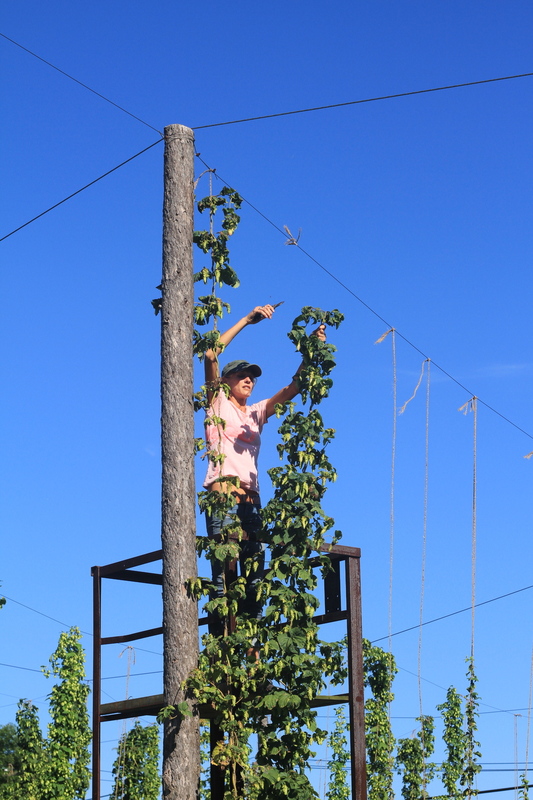 I recently made my way out to North Fork, Long Island to visit a great little hop farm, Farm to Pint, and get my pick of fresh hops for Strong Rope's first wet hop ale. Farm co-founder Jaclyn Van Bourgondien was there to show us around and give us a little history of the farm and hops on Long Island. Unfortunately we missed seeing fellow co-founder Andrew Tralka to share his love of hops... next time. Their farming and home-brewing background led Andrew and Jaclyn to start Farm to Pint. With their 2 year old bines, they have started something special out on Long Island...just listening to Jaclyn talk about where they are and where they are going, you can hear the passion they have for hops and beer. More importantly you feel the excitement they have for forming relationships with brewers; listen to me talk about it you will find that same excitement! Beer is an agricultural product with a strong tie to our local farms. We need the best ingredients to make the best beer. That was one of the main reasons for my trip out to Farm to Pint. 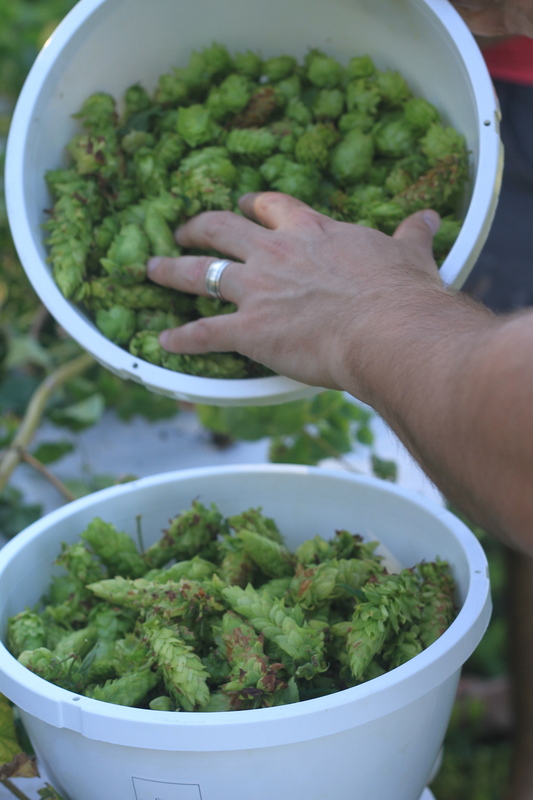 While I definitely wanted to get some fresh hops, Chinook and Northern Brewer for the wet hop ale, I really wanted to start a relationship with local hop farmers and see exactly where the ingredients I am transforming into beer come from. 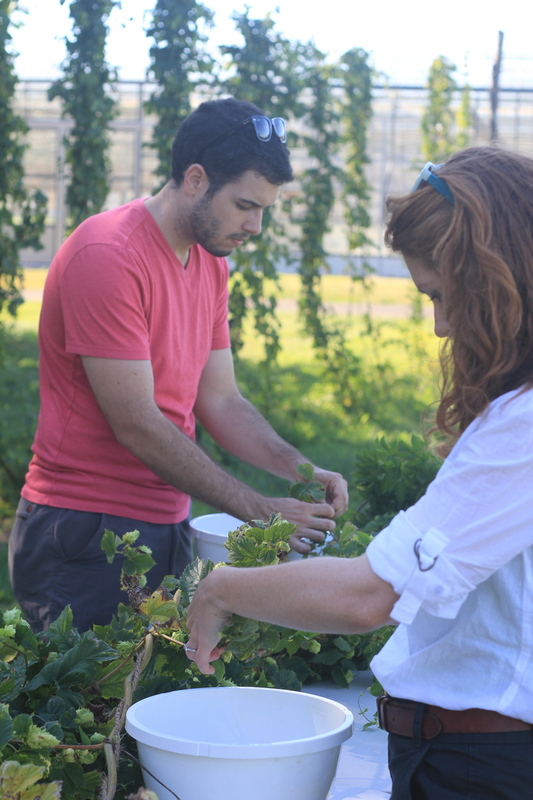 We need healthy, tasty, and fresh ingredients to have good beer, and that is exactly what Jaclyn and Andrew are doing. 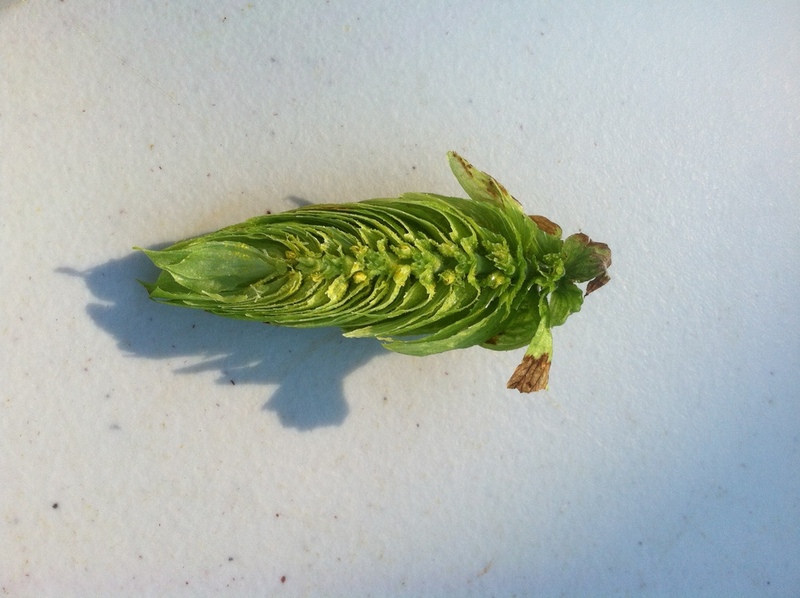 Farm to Pint's Cascade hops. Jaclyn explained the demands and challenges of the farm, including how their Northern Brewer crop didn't produce like they hoped this year and they will most likely have to scrap those bines and plant one of their more productive varieties. This loss of time, effort, and money can be difficult for small farms who don't have the luxury of extended experimentation as they need to be sure that what they plant is going to grow well to produce maximum hops on their limited acreage. Other challenges include invasive species (Japanese Beetles), disease, and weather, so they need to pick strong varieties that will survive during the limited the growing season. Despite these, the obvious passion and pride Jaclyn has for what she is doing is inspiring. Jaclyn also gave an anatomy lesson of the hops cutting a cross section of the Northern Brewer and showing the lupulin glands and the sticky bright yellow resin. The aroma as we crushed the cone between our hands was amazing, a bright woody, minty quality came across in the Northern Brewer, while the Chinook had much more of a melon, grape-fruit, spiciness. Both perfect hops for a wet hop ale. Close up of my mug, sniffing hops! While New York used to be the agricultural center for North American hops, disease, prohibition and other factors forced hops out of the north east to the west and only just recently have hops started to come back into their own in New York. It is important for us as brewers, whether home or commercial, to work with these farmers in growing the best hops they can and to let them know what we want and need for our beer. This is a relationship that is not only beneficial to develop because these farmers are awesome people, but also because it will help make better beer. As we move forward with Strong Rope Brewery and applying for a Farm Brewery license we look forward to making many more of these ties. 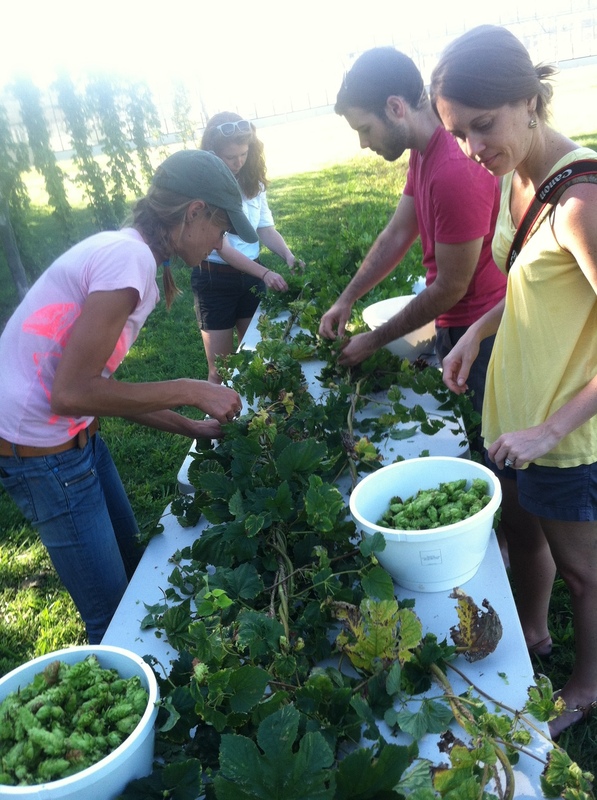 Cheers and thanks to Jaclyn and Andrew (and to all the other New York hop farmers) for all they grow!